Increasingly dense urban environments, covered car parks and multi-level highways pose a significant problem to vehicle navigation systems. Two techniques are used: dead reckoning and map matching but using the latter increases complexity and creates a dependency on 3rd-party providers of accurate map data. Also, the map data is constantly changing, especially in high-density cities. By Florian Bousquet, Product Marketing Manager, u-blox. An alternative approach is to use a multi-GNSS receiver that provides accurate positioning in three dimensions while reducing reliance on external map matching software to enable reliable navigation. This article describes this technique, which has been successfully demonstrated in difficult areas such as Manhattan and Shanghai. It’s an approach that simplifies software development requirements for vehicle navigation systems, reducing development time and cost. Standard Automotive Dead Reckoning (ADR) solutions in first-fit navigations systems usually implement a cascaded approach, using a filtered position from a standard GNSS receiver and fusing it with external sensor data from a gyro, accelerometer and/or wheel tick sensors in a second filter. (Wheel tick sensors are encoders that measure the precise speed or distance a wheel travels. Depending on the type of encoder, it’s also possible to determine the direction of movement). Both filters are Kalman, or Linear Quadratic Estimation (LQE), types. They implement an algorithm that uses time-series measurements, which include random variations, to estimate unknown variables. The real-time filter first estimates the current state variables with their uncertainties then uses the next measurement to update these estimates using a weighted average calculation. A limitation of standard ADR system design is that cascading two Kalman Filters introduces an inevitable accumulation of errors that leads to degradation of positional accuracy. Hence, navigation systems are increasingly dependent on map matching algorithms to be able to compensate for the accumulated errors. This creates a dependency on external, dynamically changing map data and, more importantly, adds software and resource development overheads required to interface the GNSS receiver to the external mapping service. To address these issues, u-blox developed a tightly coupled ADR algorithm that blends data into a single Kalman Filter. The solution, refined over four generations of products, combines satellite navigation data with individual wheel speed, gyroscope and accelerometer information. Based on this integrated and simplified technology, estimation errors are reduced to a minimum and accurate positioning is achieved regardless of where the vehicle is driven, should this be in a tunnel in Switzerland or in the middle of Manhattan skyscrapers. Dependency on map matching is significantly reduced because the technology is able to accurately track position in urban environments without relying on external map data. This means that navigation engineers can minimise the use of map matching and reduce the design effort required to integrate dead reckoning into the navigation system. This results in lower development costs. 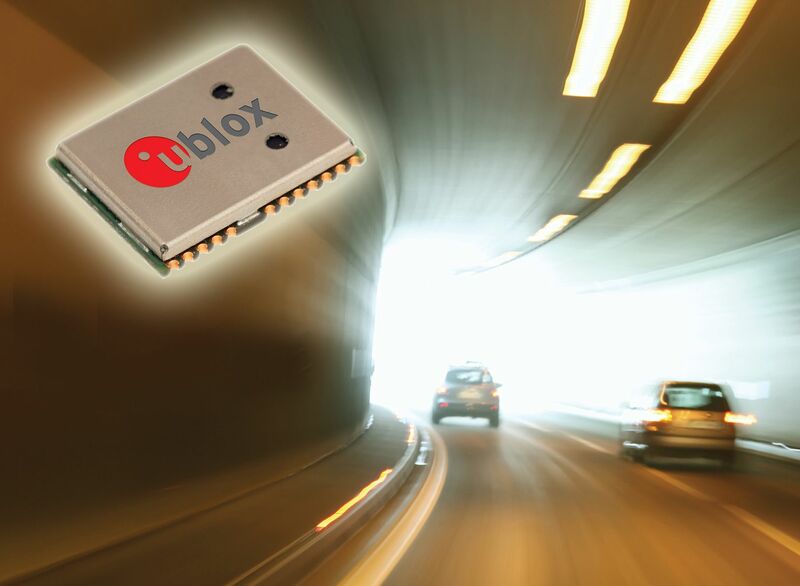 To provide uninterrupted positioning under all road conditions, u-blox’ 3D ADR solution comprises two components: the core ADR technology integrated into a chip, the UBX-M8030 (available in two AEC-Q100 qualified versions); and the NEO-M8L (shown in Figure 1), a compact, GNSS satellite positioning module. Designed for first-mount as well as after-market vehicle navigation systems, both the ADR chips and NEO-8ML require minimum to no pre-configuration and, after initial set-up, retain calibration permanently. Another key design advantage is that the placement of the product in the vehicle is not dependent on its orientation: this can be compensated for during factory calibration or even during driving. This 3D, single-filter ADR solution not only improves positioning accuracy, it does so in a way that minimises design time and cost, and system size and complexity. The self-calibrating ADR chips, which measure 5.5x5.5x0.59mm, support various sensor combinations including wheel ticks, single- or three-axis gyroscope and single- or three-axis accelerometer. Accelerometer support gives improved accuracy during altitude changes without a GNSS signal. The chips are based on a 72-channel u-blox M8 engine that offers at time-to-first fix from a cold start of 26 seconds or just 1 second from hot starts. The chips are Galileo-ready (E1B/C) and upgradable using firmware in external Flash memory. The NEO-M8L is a 12.2x16.0mm module and the first of its kind to integrate a 3D accelerometer and gyroscope with a global positioning chip. It features achieves industry-leading navigation sensitivity of -167dBm and relies only the internal accelerometer and gyro to calculate a precise geographical position for a vehicle no matter where it is located, indoors or outdoors. The integration minimises external component count, system size and BOM cost. A block diagram for the NEO-M8L is shown in Figure 2. NEO-M8 modules use concurrent GNSS receivers to receive and track multiple GNSS systems (e.g. GPS, GLONASS, Galileo-ready, BeiDou and QZSS signals). The dual-frequency RFFE architecture means that two of the three signals can be received and processed concurrently. By default M8 receivers are configured for concurrent GPS (including SBAS and QZSS) and GLONASS reception. If power consumption is a key factor, then the receiver should be configured for single GNSS operation using either GPS or GLONASS or BeiDou. The Russian GLONASS satellite system is an alternative to the US-based GPS. The ability to receive and track GLONASS L1OF satellite signals allows the design of GLONASS receivers where required by regulations. The modules also receive and track B1 signals provided by the BeiDou Navigation Satellite System. The ability to receive and track BeiDou B1 satellite signals in conjunction with GPS results in higher coverage, improved reliability and better accuracy. BeiDou currently provides only regional coverage only but global coverage is scheduled for 2020. When Galileo E1B/C signals become available, the NEO-M8L receiver equipped with an SQI Flash memory will be capable of receiving and processing them via a firmware update.